As I’ve previously noted, I’m a big fan of the beer flight and have had them served to me many different ways. This one time, I had a flight served to me on a paddle. This other time, I had a flight served to me on a ski. But most times, my flights are served on just a sheet of paper. During this year’s Jersey Week family vacation to Universal Orlando, while dining at Jake’s American Bar in the Loews Royal Pacific Resort, I knew I’d be buying yet another flight of beer because this one was going to be served in a little wire plane (I’m a sucker for pretty packaging), and as an added bonus, this flight was an opportunity to partake of some local Florida beers. And if all that weren’t reason enough to order one, if I liked one of the beers that I sampled, a full pint would only cost $5. After a quick scan of the board listing all of the current beers on tap, I was ready for take-off! 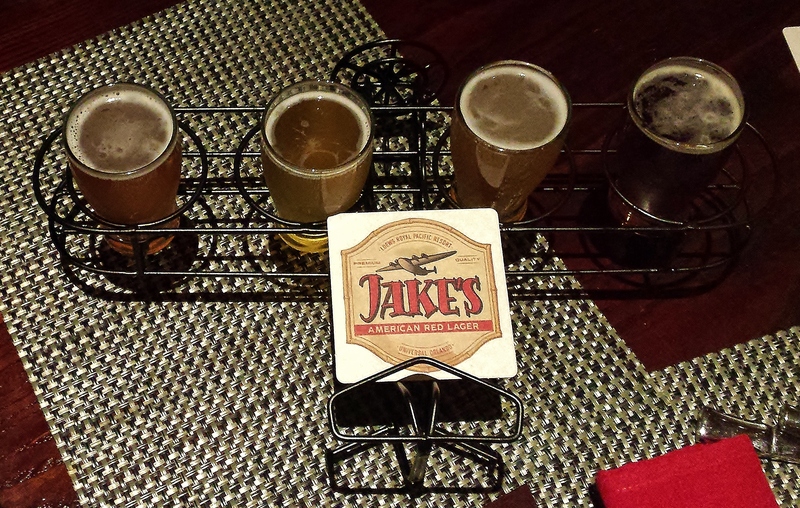 For this flight I selected the Cottonmouth (a Belgian Witbier from Swamp Head Brewery), the Take Two Pils (a Pilsner from SweetWater Brewing), the eponymous Jake’s American Red Lager (brewed especially for Jake’s by Florida Brewing Company) and a Stone IPA. Okay, I realize that the Stone IPA isn’t a Florida beer, and it doesn’t really belong on this list. I picked the Stone IPA as my “safety beer” in case my other three selections were a little lacking and because a pint of Stone for $5 is a pretty good deal. First up was the Cottonmouth. That’s all it said about this beer on the board. Not Cottonmouth Witbier. Not Cottonmouth from Swamp Head Brewery. Just Cottonmouth. So I ordered a sample without asking any questions and that was a bit of mistake. The beer itself wasn’t bad, I’m just not a big fan of Belgian Wits. Here’s what I was able to find out about this beer and its brewer..
Indigenous to North Florida, it’s not hard to find this creature around the swamp. Its white head leaves wisps of lace on the glass and a subtle sweet finish. Indulge yourself with a home grown witbier brewed in the Belgian tradition. Cottonmouth is brewed using traditional witbier ingredients and a Belgian ale yeast. The result is a crisp and refreshing Belgian witbier with a delicate mix of fruity esters and spicy phenols. Appearance: Golden straw color with nice foam. Aroma: Very faint aromas. A little doughy. Taste: Taste is a little flat and a bit watery with an odd note. Coriander perhaps? Take Two Pils is a step into an alternate reality for SweetWater, a head-first dive down the rabbit hole into the Wonderland world of lagers. This adventurous golden blonde German style pilsner is brewed with a mad hatter’s dose of spicy floral hops. It’s beautifully Bohemian in body, earthy in soul, and it’s moving low. Go ask Alice, I think she’ll know. Call us in the morning! Appearance: Cloudy yellow color with thick foam. Aroma: A little wet bread and hops. Taste: Medium body. Above average Pilsnery flavors. Finally, I moved on to the Jake’s American. I’m a fan of American Amber / Red Lagers (Dundee and Killian’s played a part in my not-so-misspent youth), so I was saving this one since I was hoping that I would really enjoy it. As with most brew pub special brews, the actual brewer drives the bus. In this case, the beer is produced for Jake’s by the Florida Beer Company. This brewer is an amalgam of sorts because in addition to owning Florida Beer, they also own the assets and brands of Key West Brewery, Ybor City Brewing Company, and Hurricane Reef Brewery. Thanks to owning all of these brands, Florida Beer Company is the third largest craft brewer in the State of Florida. Appearance: Copper color with clear, light foam. Aroma: Hints of roasted malt. Taste: A bit more flavor than I was expecting. Nice roasty character as a backbone to a good red lager. Excluding the Stone IPA which is in a decidedly different class from the other three, I found the Jake’s American to be the best of the three local beers I sampled. It’s really more of a wheelhouse beer for me and it certainly fit in with the expected characteristics of the class. Was it a great beer? No, not at all. But it certainly pared well with my burger. I thought the Take Two Pils was a good representation of a Pilsner. That said, it was still just a Pilsner. As for the Cottonmouth, it was a bit of a watered down Belgian Wit. Since I’m not even a fan of really good Belgian Wits, I didn’t find this one to my liking at all. I do love a craft beer flight! Think we can get our hands on one of those wire planes? Think of the beertography I can do with one of those! I can only imagine the intricate photos as you recreate WW1 aerial battles with planes laden with beers from the representative countries. I think you would have liked the Cottonmouth and who turns down a Stone? Ohhhh! Can I be the Red Baron? Nice! Thanks for the info, Ed!